Atlantic City Rescue Mission Chaplain Mark Engler, center, and Erin Bowes, left, of Jewish Family Service, talk Thursday to Larry Stevenson, 59, who says he has been living under the Atlantic City Boardwalk since his rental assistance ran out in October. Larry Stevenson agreed to go to the Atlantic City Rescue Mission with Chaplain Mark Engler, right, after outreach workers and police found his camp under the Boardwalk. ATLANTIC CITY - Police and outreach workers conducted a sweep of the Atlantic City Boardwalk on Thursday morning in an effort to connect the resort's homeless with food, shelter and social services. Before sunrise, officials had already started canvassing 1.5 miles of beach and Boardwalk. The sandy underworld below the Boardwalk is one of several hideaways - casino stairwells and bus terminals are others - for unsheltered homeless residents. 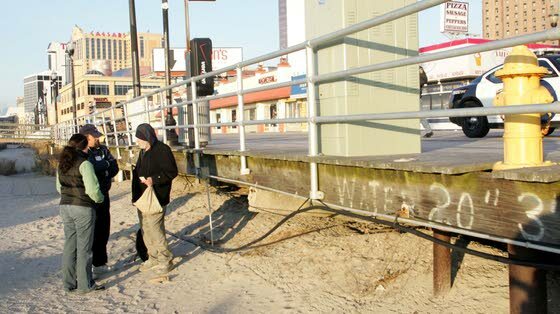 During the three-hour sweep, officials encountered nine homeless people on and under the Boardwalk. Four agreed to go with Atlantic City Rescue Mission Chaplain Mark Engler to the agency's Bacharach Boulevard site. The other five made appointments with Jewish Family Service outreach worker Erin Bowes. Bowes already knew some of them. So did her boss, Ann Thoresen, supervisor of the Projects for Assisting Transition from Homelessness and supportive housing programs. "It's more or less about building that relationship," Bowes said. "If the only thing they want to do is meet with us once a week or say hello, or accept a pair of socks, we're going to do that and keep visiting with folks and leave that door open so when they decide they want help, we can help them." Bowes said she has made contact with as many as 25 homeless people in a single morning during the summer. She attributed those larger crowds to warmer weather and the seasonal closing of Sister Jean Webster's Kitchen on Pacific Avenue, which feeds the homeless starting at 7 a.m. weekdays during the resort's off-season. Some people also likely have stayed away since a cleanup last week by city Public Works crews cleared debris from under the Boardwalk, Bowes said. The nine-man job cost the city $500 in tipping fees to dispose of the refuse at the Atlantic County Utilities Authority landfill in Egg Harbor Township, according to Public Works Director Paul Jerkins. "The goal is to maintain a healthy and safe environment for our residents and visitors," Jerkins said. "People looking to set up shop under the Boardwalk is not safe and could be a health hazard." Workers had piled sand in some places to discourage entry under the Boardwalk and also removed the trash, blankets and extra clothing that serve as insulation and, sometimes, kindling. Set for warmth, the small fires can and have spread to the Boardwalk and adjacent shops. Fires in November destroyed parts of Schiff's Central Pier and the Boardwalk behind it. Mayor Lorenzo Langford sent a memo Wednesday to administrative and public safety officials reminding them that he wants debris sweeps conducted more frequently. The document said the suggestion came from resort stakeholders who convened recently for a trio of summits. The order did not offer more details. Langford spokesman Kevin Hall did not return calls for comment. In the past, the sweeps have occurred once or twice monthly, Jerkins said. Larry Stevenson, 59, was among those who agreed this morning to go with Engler to the mission after Bowes and police found his camp beneath the Boardwalk. Stevenson said he arrived in Atlantic City 12 years ago from Wilmington, Del., and promptly gambled away his last unemployment check. He spent eight years living outdoors but managed to put a roof over his head for the next few, he said. Then, in October, his temporary rental assistance ran out. He said he now cashes out money left in casino slot machines to pay for the steady flow of beer he says he drinks only to keep the shakes away. "I haven't been drunk in years, but I do drink every day," he said. "Alcoholism runs on both sides of my family." Police could have ticketed Stevenson for trespassing under the Boardwalk, but they did not. Instead, officers helped outreach workers draw him out and talk him into driving back to the mission with Engler. Like most other clients there, Stevenson will bathe, eat and change into clean clothes. He also will have access to medical and mental health care and advice on legal, housing and other issues. Meanwhile, staff will try to convince him to commit to a longer-term program aimed at preparing graduates to live independently and off the streets. The mission provides 295 of 322 available emergency shelter beds in Atlantic County, according to the federal Department of Housing and Urban Development's housing inventory from 2008. Covenant House at Atlantic and Virginia avenues provides the other 27 beds to people younger that 22. When caseload demands it, the agency hosts more than twice that many. Additional clients sleep on mats, according to Executive Director Brian Nelson. "We don't want to turn anyone away," he said. "We're going to work with them until they get it. Meaning, they leave the street behaviors behind." Funding cuts have forced Nelson to stop his previous practice of sending his staff on the bimonthly sweeps in favor of maintaining services provided by doctors, dentists, lawyers, counselors, social workers and other professionals. Some are full-time staff, while others donate or discount their services, he said. 136 of them listed their last address as Atlantic City, which topped an 11-town list that also included Pleasantville and Philadelphia. Source: 2009 Point-in-Time Survey. Outreach agencies statewide conduct the surveys Jan. 27 every year. Experts estimate the surveys capture about half the true count.